Last week we talked about cooking the turkey. Now we need gravy to go with it. It’s easy to make. Honest. Just follow these directions. Mix the cornstarch and milk together in a small bowl or a glass jar with a lid until there are no lumps. Pour this mixture into the two cups drippings from the turkey in a saucepan. Slowly heat until boiling. As the gravy thickens, add a little more milk if consistency isn’t right. 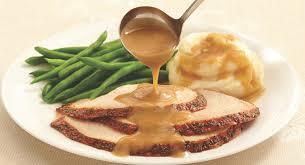 If the gravy gets too thin, add another tablespoon cornstarch to a small amount of milk to thicken. See, it’s just that easy! This has been our family tradition for years. Hope you enjoy it!